Seikatsu is a colorful game of tile laying. Players take turns playing garden tiles to collectively build a beautiful garden. Can you create the best view to admire from your pagoda? Place the game board in the middle of the table. Each player should be directly facing one of the pagodas. Place each player's scoring marker on the 0 space of the score track. Put all the garden tiles in the cloth bag and mix them up. 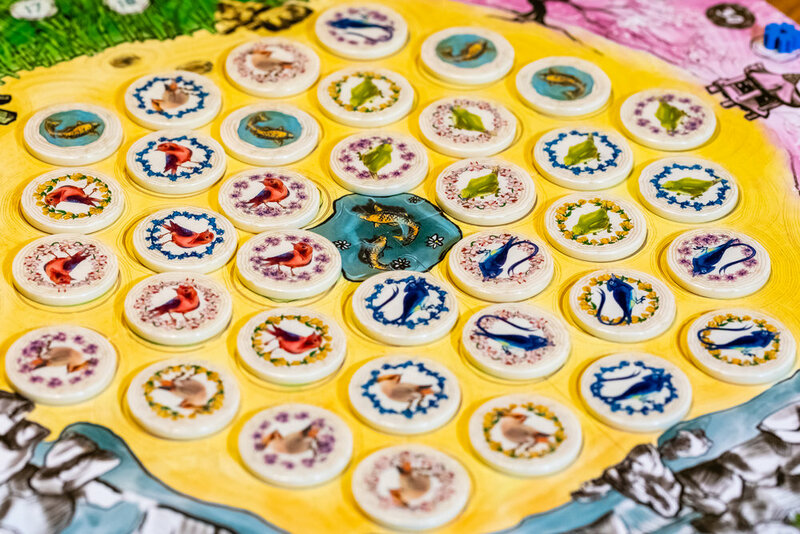 Draw 2, 3 or 4 tiles depending on the number of players and place them on the board next to the koi pond as shown on the diagrams in the rule book. Add the koi pond tiles to the cloth bag and mix them up. Each player draws 2 tiles from the bag, facedown and adds them to their hand. The wisest player takes the cloth bag and goes first. Play a Tile: Play a tile on an empty space adjacent to another tile on the garden boad. Score Matching Birds: If the bird on the tile you just played matches a bird on an adjacent tile it forms a Flock of Birds. Score 1 point for the bird you just played and one point for each matching bird on an adjacent tile. Draw a new tile: Draw a tile from the bag and pass the bag to the next player. On the last two turns of the game no tiles will be left in the bag. A koi pond tile is a Wild tile. 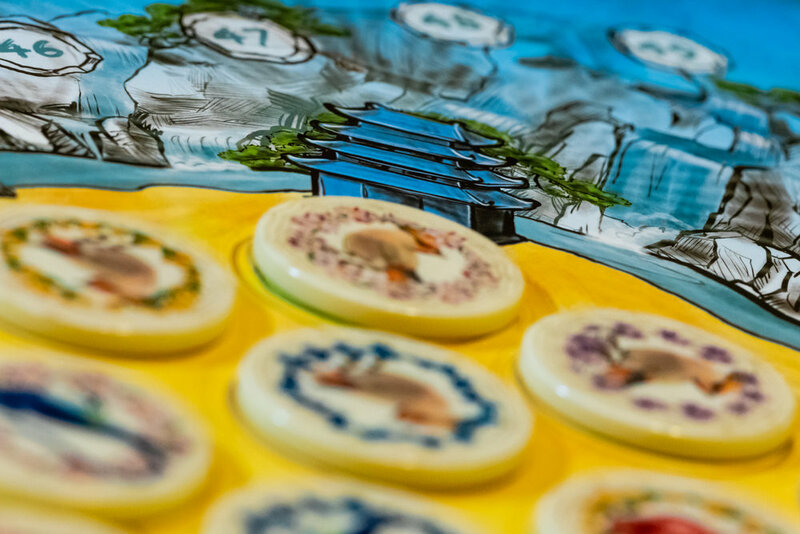 The koi pond tile counts as a bird of your choice on the turn it is played and as a flower of your choice at the end of the game. Once your turn is over, the tile no longer counts as a bird and is never scored again until the end of game. Once all tiles have been placed the game ends. Each player will now score rows of flowers. Flowers are scored in rows from the perspective of your pagoda. This means that the rows you are to score are based on the direction your pagoda is facing on the game board. In each row, identify which color flower you have the most of and score points using the scoring chart. The box is a reasonable size to not take up too much space on your shelf. It could fare to be a bit smaller but not without compromising the size of the game board. The components are very good quality. The score markers are small, but it has no impact on the quality of the game. 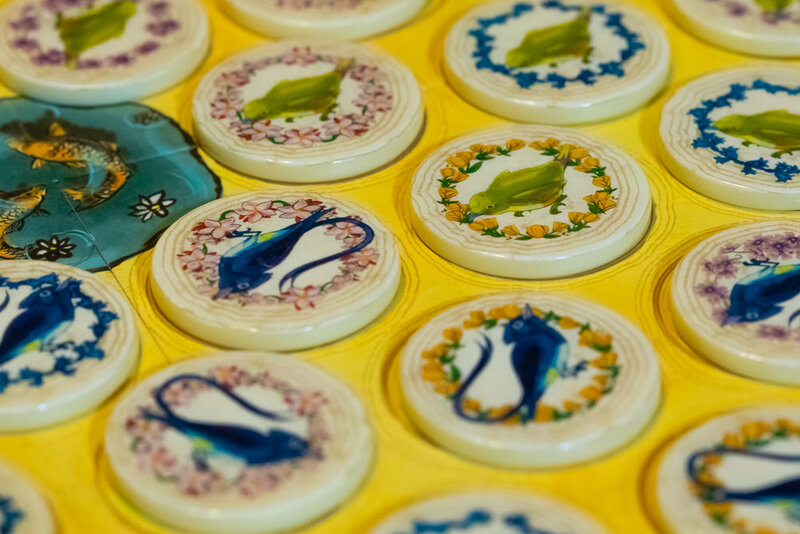 The garden tiles are absolutely fabulous and won't see much wear, if any, no matter how often you play the game. The rule book was very easy to understand and full of diagrams that you can quickly reference if you have questions about setup, placing a tile or scoring. I found when teaching the game, that scoring flowers was the hardest part to explain. I would recommend showing new players the diagram on scoring at the back of the rule book prior to their first game. Other than that, the game is incredibly easy to teach. If you do find someone who still struggles to understand scoring, I am confident they will be all caught up after a single play through. The game plays equally well with 2 or 3 players. Seikatsu can be played solo which I admire. I would find myself disappointed to buy a new puzzle game these days without the option to play solo. Not only can you play this on your own, but there are three different variants that can be u sed to increase or decrease the difficulty. In a four player game players take on each other in teams of two. Unfortunately, I haven't had an opportunity to try a 4 player game game but it looks quite enjoyable as well. No matter the number of players Seikatsu appears to be perfectly balanced. I love figuring out if it will be more beneficial to place my tile for the immediate benefit of scoring a flock of birds, the delayed benefit of scoring flowers at the end of the game or even for the delayed benefit of making my opponent score less when they count up their own flower tiles. The game plays in 30 minutes as the box suggests. Setup and clean up can both be done in under a minute. Don't assume this makes the game any less desirable for experienced gamers though. 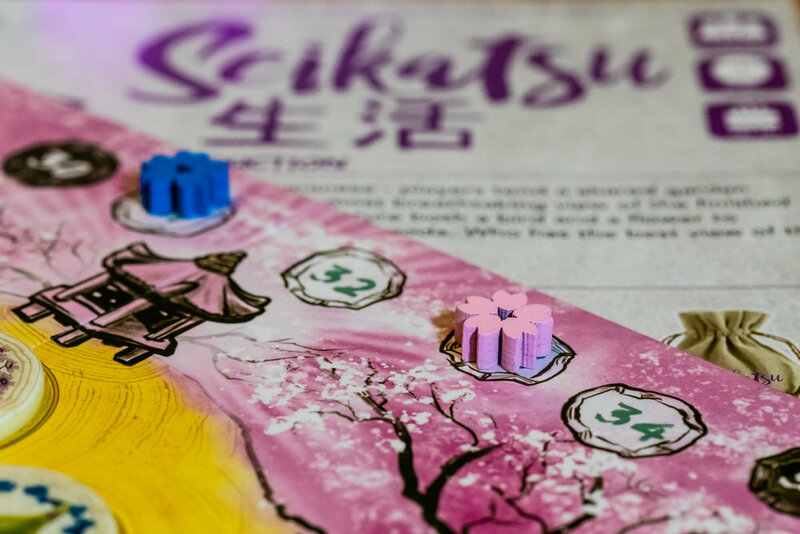 Seikatsu is elegant in it's simplicity and can be enjoyed by a wide range of gamers both age and experience wise. If you enjoy puzzle games, I guarantee you'll enjoy this one. Tell me your own thoughts on Seikatsu in the comments below.